The global economy has been living through a period of central bank insanity, thanks to a little-understood expansion strategy known as quantitative easing, which has destroyed main-street and benefitted wall street. Central Banks over the last decade simply created credit out of thin air. Snap a finger, and credit magically appears. Only central banks can perform this type of credit magic. It’s called printing money and they have gone on the record saying they are magic people. Increasing the money supply lowers interest rates, which makes it easier for banks to offer loans. Easy loans allow businesses to expand and provides consumers with more credit to buy goods and increase their debt. 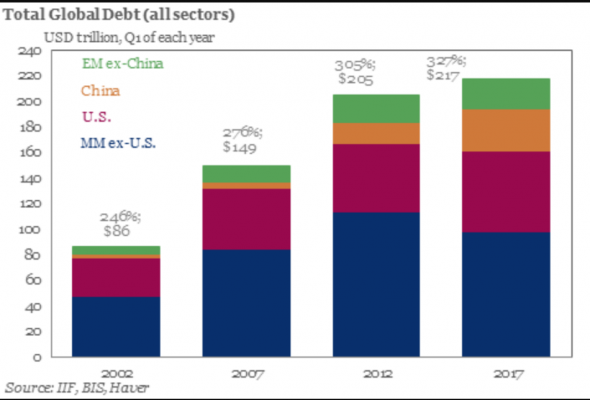 As a country’s debt increases, its currency eventually debases, and the world is currently at historic global debt levels. 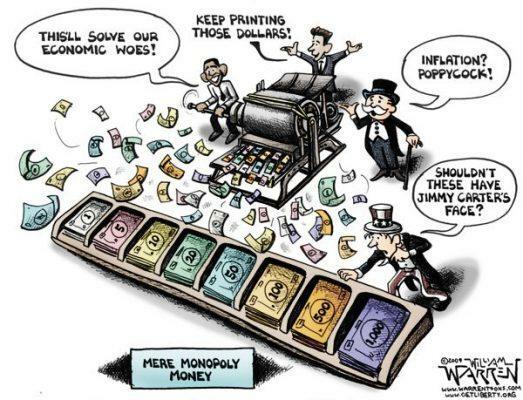 Simply put, the world’s central banks are playing a game of monopoly. With securities being bought by a currency that is backed by debt rather than actual value, we have recently seen $9.7 trillion in bonds with a negative yield. At maturity, the bond holders will actually lose money, thanks to the global central banks’ strategies. The Federal Reserve has already hinted that negative interest rates will be coming in the next recession. These massive bond purchases have kept volatility relatively stable, but that can change quickly. High inflation is becoming a real possibility. China, which is planning to dethrone the dollar by backing the Yuan with gold, may survive the coming central banking bubble. Many other countries will be left scrambling. Some central banks are attempting to turn the current expansion policies around. Both the Federal Reserve, the Bank of Canada, and the Bank of England have plans to hike interest rates. The European Central Bank is planning to reduce its purchases of bonds. Is this too little, too late? The recent global populist movement is likely to fuel government spending and higher taxes as protectionist policies increase. The call to end wealth inequality may send the value of overvalued bonds crashing in value. The question is, how can an artificially stimulated economic boom last in a debtors’ economy? Central bankers began to embrace their quantitative easing strategies as a remedy to the 2007 economic slump. Instead of focusing on regulatory policies, central bankers became the rescuers of last resort as they snapped up government bonds, mortgage securities, and corporate bonds. For the first time, regulatory agencies became the worlds’ largest investment group. The strategy served as a temporary band-aid as countries slowly recovered from the global recession. The actual result, however, has been a tremendousdistortion of asset valuation as interest rates remain low, allowing banks to continue a debt-backed lending spree. It’s a monopoly game on steroids. The results of the central banks’ intervention were mixed. While a small, elite wealthy segment was purchasing assets, the rest of the population felt the widening income gap as wage increases failed to meet expectations and the cost of consumer goods kept rising. The policies of the Federal Reserve were not having the desired effect. 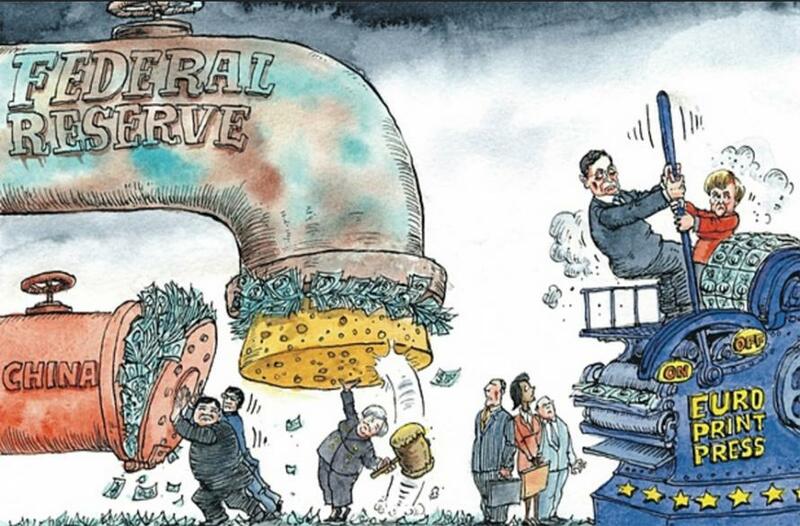 While the Federal Reserve Bank began to reverse its quantitative easing policy, other central banks, such as the European Central Bank, the Swiss National Bank, and the European National Bank have become even more aggressive in the quantitative easing strategies by continuing to print money with abandon. 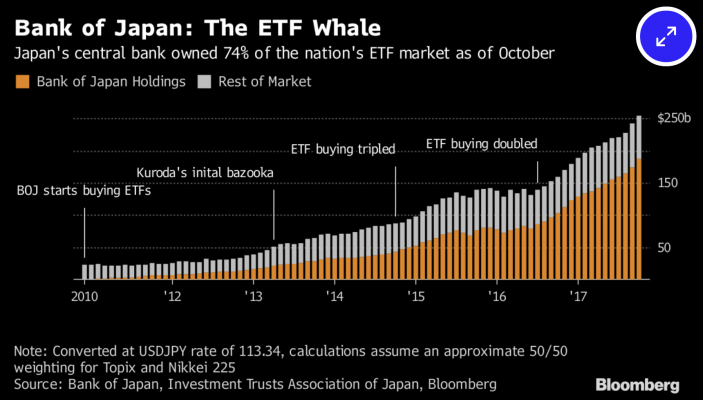 By 2017, the Bank of Japan was the owner of three-quarters of Japan’s exchange-traded funds, becoming the major shareholder trading in the Nikkei 225 Index. The Swiss National Bank is expanding its quantitative easing policy by including international investments. It is now one of Apple’s major shareholders, with a $2.8 billion investment in the company. Centrals banks have become the world’s largest investors, mostly with printed money. This is inflating global asset prices at an unprecedent rate. Negative bond yields are just one consequence of this financial distortion. While the Federal Reserve is reducing its investment purchases, other global banks are keeping a watchful eye on the results. Distorted interest rates will hit investors hard, especially those who have sought out riskier and higher yields as a consequence of quantitative easing (malinvestment). The policies of the central banks were unsustainable from the start. The stakes in their monopoly game are rising as they are attempting to rectify their negative-yield bond purchasing with purchases of stocks. This is keeping the game alive for the time being. However, these stocks cannot be sold without crashing the market. Who will end up losers and winners? Middle America certainly isn’t going to be happy when the game ends. If central banks continue in their role as stockholders funded by fiat currency, it will change the game completely.